Bruch was born in Cologne, Rhine province, and received his early training from his mother. His father was a lawyer. His mother was a soprano and music teacher. Max began his musical studies as a pianist. Bruch started composing as a child, displaying an extraordinary musical talent which was recognized as such by Ignaz Moscheles. In 1852, aged just 14, he wrote a symphony and a string quartet, the latter work bringing him a scholarship from the Frankfurt-based Mozart foundation, which enabled him to study with Ferdinand Breunung, Ferdinand Hiller, and Carl Reinecke. In 1858, having embarked on a teaching career in Cologne, he produced his first opera. He visited several important German cultural centres between 1861 and 1862. He had a long career as a teacher, conductor and composer, moving among musical posts in Germany: Mannheim (1862-1864), Koblenz (1865-1867), Sondershausen, (1867-1870) Berlin (1870-1872), Bonn, where he spent 1873 -1878 working privately. At the height of his reputation he spent three seasons as conductor of the Royal Liverpool Philharmonic Society (from1880), but he did not get along with the players, who had rather lax standards. In 1883 the eminent composer travelled to the United States for an extensive tour which took him, among other cities, to Cleveland where on 26 April an enormous concert of his works was presented in the Ontario Street Temple. In 1883 Bruch left the Liverpool Philharmonic and became director of the Breslau (now Wroclaw, Poland) Orchesterverein, where he stayed through to the end of the 1890 season. That autumn, Bruch took up an appointment as professor of composition at the Berlin Hochschule für Musik, working there until his retirement in 1911. When Bruch died in late 1920, three months before his 83rd birthday, we were at a time when Stravinsky was already very famous, Schoenberg was immersed in dodecaphony, Bartók had his first two string quartets behind him, and microtonal music was well enough established that in some places it was being viewed as the next big thing. Bruch obviously did not relate to any of this. As a composer he was always a conservative, in the style of Brahms. Bruch was a strong opponent of the 'modern madness' and 'modernists' like Strauss, Reger, Debussy (the latter defined by him as an 'unqualified scribbler') and others, and felt bitter that he was being boycotted because of his traditional style and his open opposition to these new tendencies. One of the most curious works of his musical creations was the Double Concerto in E minor for Clarinet, Viola and Orchestra, Op.88 – written at the end of 1911 and premiered in March 1912. It is, up to the end of the 20th century at, the only concerto in existence for this combination, but early reviews classed it “weak, unexciting … unoriginal”. This again should be judged in the context of the times; only two years later in 1913 the world witnessed the premiere of Stravinsky’s Sacre du Printemps! In historical perspective it can be seen that the Double Concerto well features the expressive, lyrical tendencies of each solo instrument. In this work, as in the ‘8 Pieces, Op.83’ which we will examine shortly, Bruch’s son Max Felix was to have an important role. The Concerto for Clarinet and Viola is a well-crafted work for an unusual combination of instruments. Bruch recognized that the dissimilar sounds of the instruments would work exceedingly well together, perhaps because they were in basically the same register. His son, Max Felix Bruch (to whom the score is dedicated) was a gifted clarinettist, his playing even compared to the great Mühlfeld, so he certainly understood the potential of the instrument. However, unfortunately this work is only very rarely performed nowadays. In the eight pieces of Max Bruch – Opus 83 – Bruch had again selected instruments of that mellow character of the alto register. The eight pieces vary in length, but taken together they are twice as long as the Double Concerto, and in many ways more daring. The official date of the compositions is generally given as 1910 – and indeed, Simrock published the work this very year shortly after its completion, also producing parts for violin (instead of clarinet) and cello (substituting viola). However, the seeds of the composition actually began some two years previously when Bruch had pencilled in much of the part-writing. Today it is generally heard in one of two possibilities – Clarinet-Cello-Piano, or Clarinet-Viola-Piano. Bruch was certainly aware of the successful predecessors he had at his disposal to make an initial judgement as to the effectiveness of a new work for these instruments: especially the ‘Kagelstatt’ trio of Mozart, the ‘Fairy Tales’ of Schumann, and the trio Op.114 of Brahms. They bear no programmatic titles, and the eight pieces do not form a cycle in any sense. It is thus feasible to perform selections from them in any satisfying order, especially taking into account that this precisely tallies with the composer’s wish that he did not intend the work to be performed in its entirety at any one time. Each piece is a self-contained unit. Bruch himself gave no indications of his preferred order, or even of how many should be performed at one hearing, and only referring as to his favourite numbers individually (for example No.3 in C# Minor, and No. 5 in F Minor). harpist from Cologne. He hoped that the C# minor trio (piece No.3) would be well received and believed it was one of the most important – with its special dialogue between clarinet and viola/cello, and that consequently this piece would be imperative to include; also that if the harp was finally present (at Bonn) then the ‘Nachtgesang’ (piece No.6) and the ‘Rumänische Melodie’ (piece No.5) must also be played. A quick assessment of the piano arpeggio-type accompaniment to Nos. 3, 5 and 6 would surely confirm the possibility that the harp, and not piano, was originally intended to join the other instruments in these pieces. Unfortunately no news has been discovered about the Bonn performance, but his son did give further successful performances in Cologne and Hamburg in later in 1909. Prior to the Simrock publication in 1910 there has been no correspondence unearthed with the publisher as to what actually happened with the harp part; one can only assume that Bruch finally had to discard its use (probably upon pressure from Simrock) on account of its potentially very limited sales in such a published form. In recent times efforts have been made to re-install the harp – for example in a 1998 Arizona festival (USA) there were transcriptions made for harp at the festival. In the case of the cello part, Bruch revised the writing – this is no mere exercise writing out for cello an octave lower, but in many cases the cello possesses a different line altogether. previous second string quartet, and was to be first of several interesting chamber works. b) with this very work he entered into the last phase of his life. From April 1911 he retired from his official duties at aged 73. 1) – Eb minor. (Op.83 No.8). This piece is especially romantic, in which the melody is totally given to the autumn and sentimental mood. It contains the most daring harmonies from the ‘Bruch-ian language’ which are indeed in some moments are almost post-Brahms, and where one feels an ‘out of this world’ feeling, giving the impression here that Bruch was exploring his own stylistic limits. 3) – B minor. (Op.83 No.2). This piece is cast in a fast 3/4 time, but without the character of a waltz or a scherzo. It is a somewhat stormy piece, reminiscent of Brahms. However finally the piece comes to rest in the major key. 4) – B major. (Op.83 No.7). An energetic scherzo, that remains us of Mendelssohn. This piece, the most festive composition of all, contains two secondary episodes of a more relaxed and contrasted nature. 5) – A Minor. (Op.83 No.1). Begins with the rhythm of a funeral march which, little by little, transforms itself into a dream-like melody. This piece in binary form has the aspect of a meditative prelude. 7) – C # minor. (Op.83 No.3). Seemingly the most important piece for Bruch according to his comments, combining intense and rhapsodic flourishes from the cello, then with a sublime slow clarinet melody. Each has his own turn ‘two verses’; however in the last clarinet section the cello dialogue is ‘clamed’ to produce a heavenly ending. 8) – D Minor (ending D major). (Op.83 No.4). An intense movement that maintains driving propulsion, even in the more lyrical episodes. Towards the close the music switches to the home major key to produce a glorious finish. 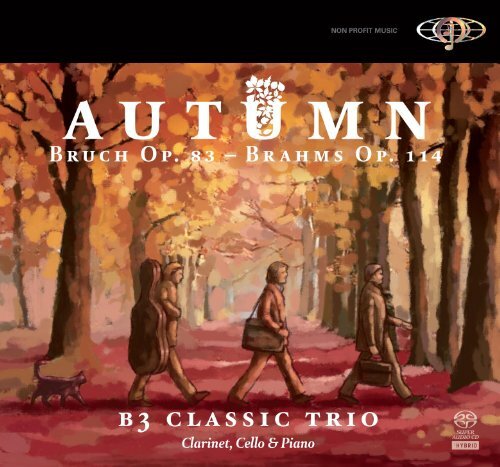 We find ourselves before one of the most valuable and singular chamber music works of late romanticism, and the ‘B3 Classic Trio’ hopes that this new recording might give an impulse to Bruch having a greater presence in the concert hall. The Brahms trio Op.114 is one of the principal works of chamber music repertory. The mature creations of Brahms go, in many cases, hand in hand with the extraordinary careers of four great musicians of the period; the clarinettist Richard Mühfeld, the violinist Joseph Joachim, the cellist Robert Hausmann, and the conductor Hans von Bulow. In 1869 Joseph Joachim (1831-1907) founded his string quartet, which quickly became famous. He was the dedicatee of the first violin concerto of Bruch, as well as various works Johannes Brahms, amongst which mention should be made of the Violin Concerto in D Major, Op.77 from 1878, and the Double Concerto in A minor, Op.102, for violin and cello of 1887. It is in this renowned quartet that the cellist Robert Hausmann (1852-1909) played; he was in this era a professor, like Joachim, in the Royal Academy of Music of Berlin. The festival of the city of Meiningen, like that of Bayreuth, attracted notable musicians. In November of 1881, Brahms was requested by the orchestra’s conductor, Hans von Bulow, to be the invited alongside the Duke of Saxony. The friendship between the Duke and Brahms was immediate, and the visits of the latter to Meiningen became frequent from that date. Bülow offers his orchestra to Brahms to rehearse his new works. Fritz Steinbach, the successor of Hans von Bülow in the orchestra, presented to Brahms the clarinettist of the orchestra, Richard Mühlfeld, in March of 1891. This very month Brahms writes to Clara Schumann “it is impossible to play better the clarinet than the way that Mr. Mühlfeld does”. Brahms, who had decided to abandon composition around 1890, and who, without any doubt, had heard the finest European clarinettists in his journeys, became spurred on by the artistry of Mühlfeld, and called him in an affectionate way “Fräulein Klarinette” and “Meine Primadonna”. In the summer of this same year – 1891 – Brahms was to compose his Trio Op.114 and his Quintet Op.115 in Bad Ischl, and both with Mühlfeld as dedicatee. In July he writes again to Clara Schumann: “he is the finest performer of wind instruments that I know”. The Trio was published in 1892 by his friend, the editor Fritz Simrock, in Berlin. In November of 1891 Brahms is invited to Meiningen, where on the 24th of the month, after rehearsing from the manuscripts, the first private rendition of the work was made – along with the Quintet Op.115 – in the court of the Duke of Saxony, George II. The performers were: Brahms at the piano, Mühlfeld on clarinet and Robert Hausmann on cello. These musicians brought about the public premiere of the trio on the 12th December of this year in Berlin; however, there was a triumphal greeting of the Berlin public from the first instance, even from the dress rehearsal on 10th December 1891. On 17th December, Brahms, Adalbert Syrinek on clarinet and Ferdinand Hellmesberger on cello gave the first performance of the work in Vienna, and which was to follow another performance in this city (21st January, 1892), again with Brahms, Mühlfeld and Hausmann. On the 30th January of 1893 it is again performed by Brahms in Meiningen. From there onwards, the Trio Op.114 has become a ‘reference of honour’ in the chamber music programmes, especially in the trios of this instrumental formation. Taking into account that then it was still common to encounter a rapid ‘substitution’ of works heard in concert programmes, and that – as we have seen – in the framework of only one month the trio was heard twice in Vienna gives an idea of the fine reception it received from the public. Richard Mühlfeld (1856-1907) initially trained as a violinist, becoming the leader/concert master in the Meiningen orchestra from 1873. He knew the clarinettist Carl Baermann, author of the famous method for clarinet and son of the virtuoso Heinrich Baermann, who inspired the clarinet works of Weber. Mühlfeld self-taught himself the technique of the clarinet, and after a few years his ability on the instrument is evident, passing over to become the principal clarinettist of the orchestra. The interpretative style of Mühlfeld was apparently very personal. In Germany he was openly praised; we already know the captivating spell he cast over Brahms or Clara Schumann. However, his interpretations and his sonority were criticized on places such as Vienna or in England; his possible use of vibrato – remember his conditioning as a violinist – his extroverted and passionate approach might be a possible cause for this. Mühlfeld was a staunch defender of the repertoire from his own time, performing across all Europe the works of Brahms and Weber, amongst others. He also was to give the world premiere of the Trio Op.45 by Robert Kahn in Berlin in 1905, which was to see some of the first fruits in the recording made by the B3 Classic Trio in the CD ‘Chamber Music Discoveries’ (Warner Music Spain). The German cellist Robert Hausmann (1852-1909) was considered in his time an illustrious soloist and teacher. He received his training with the Müller brothers and with A. Piatti. He played a Stradivarious cello (dating from his golden period – 1724), today known as the ‘Hausmann’. He formed part of Joachim’s quartet during almost thirty years. The friendship and understanding between Hausmann and Joachim were to have a great influence on his artistic evolution. His way of playing impressed Brahms, who wrote for him the second Sonata Op.99, which was premiered by Hausmann in 1886 together with the composer. In 1887 Brahms finished his Double concerto, which his friends Joachim and Hausmann premiered to great success. He was also the dedicatee of many other works, and also Max Bruch wrote for him the Hebrew Adagio ‘Kol Nidrei’ Op.47 for cello and orchestra. Our protagonists were also some of the first who expressed themselves in sound recordings of the primitive cylindrical discs (the phonograph of Eddison appeared in 1877). In a date as early as 2nd December 1889, Theo Wangermann recorded a Brahms performance on the piano; part of Libelle of Strauss, as well as a fragment of an arrangement (of 1872) made by Brahms of his 1st Hungarian Dance for solo piano. In this second recording, one can appreciate the use of rubato, some pronounced cadences, and other details which would be now surprising to our ears. The tempo of Brahms for the piece is 80 for the quaver (eighth-note), quite a lot slower than the modern recordings. Also, Joseph Joachim had the honour in being the first violinist in history to record a disc – for the company ‘Gramophone’, and which is a fascinating and worthy source of information as to the style of violin performance in the 19th century. The first news of a recording of our trio Op.114 takes us to London, made by Charles Draper, and with his niece Haydn Draper (clarinet), together with W.H. Squire (cello) and H. Harty (piano) in 1925, for the Columbia label. Reginald Kell, with Antony Pini and Louis Kentner, made a recording in 1941 for Decca. There was also a memorable recording of the Quintet Op.115, using the string quartet of Joachim’s famous pupil Adolf Busch. Of all the known recordings of this work from the 1940’s onwards, some outstanding versions have been those played by McLane/S. Hawkins/M. Kaye, the Beaux Arts Trio (con G. Pieterson), and, above all, of a live performance from 1955 in the Prades Festival featuring D. Oppenheim, P. Casals and E. Istomin. Much has been written about the supposed anachronism of the music of Brahms. Fortunately, the critics and current-day historians have amended this notion with accompanied for so long the Hamburg composer (it would be pertinent here to produce the essay of Schoenberg from 1933, revised in 1947, strikingly called “Brahms the progressive”). Brahms worked in all instrumental genres, except for the theatre and showing, at the same time openly rejecting ‘programme music’. He therefore appears as a safe deposit of the classical-romantic tradition, following from Haydn through to Schumann in a tradition in which he was to impose his personal stamp. His aesthetic search was not based, as in Wagner’s case, on extensive preliminary theoretic reflexions as to the need to found a new aesthetic system. Brahms found his path into going into depth in the rigorous study of the language of previous masters, to detect the constructive possibilities that their music offered. This served him in the present work in the use, for example, of the Lydian scale that opens the first movement, or the Phrygian scale of the theme that opens the fourth movement: also the fact – pointed out by Karl Geiringer, the biographer of Brahms – of introducing the second theme of the first movement as an inverted canon. Chamber music is the field where our composer finds himself in the intimate essence most authentically. It is here where he develops with absolute logical rigour the most dynamic formal principals of classical style: the thematic-motive elaboration which, however, provokes the breaking up of another fundamental aspect of classicism – the regular order of musical time based upon the balance or ‘reconciliation’ of a phrase. In essence, now it was not about the alternating correspondence of phrases, but based on the varied development of small nucleases of motifs. One might think, for example, about how the arpeggio motif of the cello in the very first bar undergoes transformations, or in the figure of dotted crotchet (quarter-note) plus quaver (eighth-note) of the second bar of the first movement throughout the whole of the rest of the work! On a harmonic level, Brahms increases the functional possibilities of each chord, thus guaranteeing the necessary stability for the construction of large musical architectures. The harmonic discoveries are beautiful; one can observe, for example, the transition from the subdominant in bars 22 – 23 of the second movement, or in bars 77 to 97 of the fourth movement. All four movements display a high grade of elaboration. The first of them Allegro, alla breve is presented in sonata form; its first theme is clear and vigorously diatonic, including elements which Brahms was to develop throughout all of the movement, and indeed the work. Two secondary themes appear, the first as a canon inverting the principal theme, and finally a soaring, gliding third lyrical theme which the clarinet fulfils. The development section is brief, and explores the initial theme which, however, does not appear in the recapitulation. The secondary themes make instead very different reappearances, and the movement ends with a coda of tranquil character which, based on the first of the secondary ideas, closes the movement. The Adagio is of a great self-restraint. The soft low registers contribute to the atmosphere, which is dreamy. Here, more than ever, one has the impression of reality in what Brahms’s friend, the music critic Eusebius Mandyczewski said after a performance of the work – “it was as if the instruments were in love with each other”. The Andantino grazioso, in the form of a minuet and trio, is of a beautiful airiness, and full of warmth. The initial theme of the minuet is a wonderful melodic inspiration. In the trio, the clarinet takes the reins of this Ländler, for later to reappear in abbreviated form the theme of the minuet, which flows into a coda, poco sostenuto, rather freer and of exceptional sonorities. The Finale Allegro carrying alternatives between 2/4 and 6/8 time an interesting rhythmic contrast. Although it is the ‘sonata form’ which dominates, the thematic treatment is original, for the principal theme passes up to four different secondary themes. After a brief development section, a new secondary idea appears (bars 77 to 97) of rather darker colourings which is helped by the low registers of the instruments, and then a lighter harmonic turning in bar 92 to be able to pass a bridge passage which moves towards the recapitulation (bar 105). It is the principal theme which finally comes out on top, leading the movement to a coda full of vigour and romantic breathlessness.